Hello, all. I have again been absent. For the last 36 hours I have been either in a car or in front of a customer. It was great and productive. My mom and stepdad own a wonderful bed and breakfast in the Pacific Northwest called The Quimper Inn. Clearly my mom cooks quite a bit and is always wearing aprons. I have wanted to make her one for quite a while. I decided to try it out using some fabric I had on hand. This one is not intended for her, but to see how I could make it turn out. What I found interesting about this piece of fabric was the bleeding. It looks like when this piece of hand loomed hemp linen was created it was folded over onto itself prematurely causing the color to offset onto itself. The stripes themselves are navy whereas the unintended color is more of a royal blue. I realize that a lot of people may not like the fact that the fabric is not perfect. But that is precisely what I love about it. I decided to sew it using navy thread and a serging stitch, using my new.....wonderful....machine! I thought it would make it more interesting. I want to thank Kathleen of Faded Charm for featuring my blog and Etsy store on her lovely blog. Please do check it out if you are not already a follower. I really like her style. So I think I will use this one as a template for my mom's apron. This one will go into the store for now. I wish you all a wonderful week. Thank you for the very sweet comments on my kitchen and welcome to my new followers. I am happy to have you! The apron is lovely. It will be washed, and the fabric will change from washer agitation, detergent, and the dryer (though I hope the lucky recipient won't leave it in the dryer tooooooo long!). The transfer stripes might be lost in the wash process. 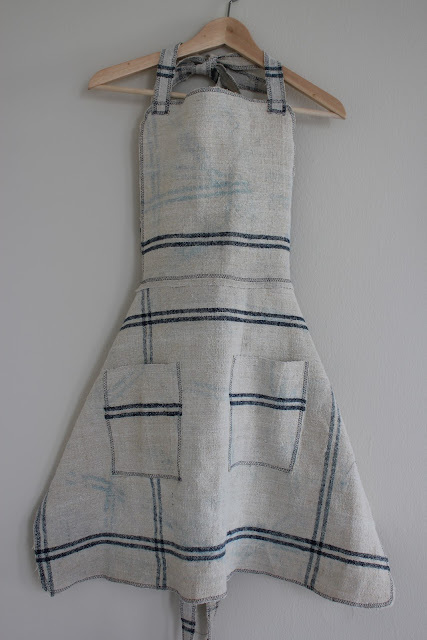 Or, the apron might all come out a nice, pastel blue! 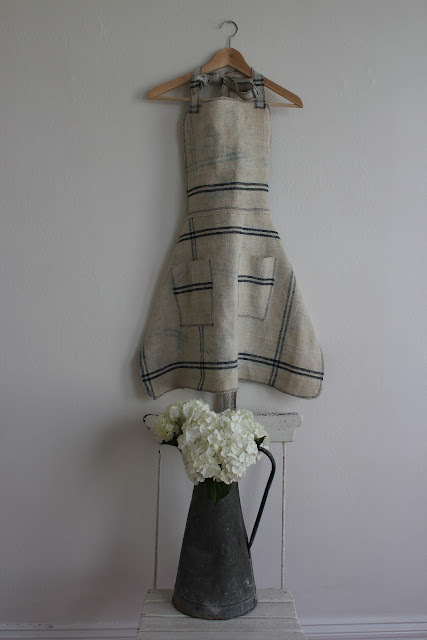 Every time it is washed, vintage fabric items gain character and become a little different from its last "look." That is the part I most value in vintage fabrics! You're so lucky to have a mom that runs a B&B! Gosh, that sounds like a fun place to visit. You must've grown up with some good food too. I like that apron. That's nice that you're making one for your mom too. I'm sure she'll get alot of use out of it! Michele...you are brilliant! I LOVE this apron! We go to Port T. quite often. Jason's (Chrislyn's husband) mom and dad live there. I will keep your family's B&B in mind should we stay the night or if we have friends that are looking for a place to stay! I couldn't believe it when I saw your post title...I have been searching for weeks for a grainsack apron and haven't been able to find one. at least not what I have in mind. Yours is lovely...your mother will be thrilled to get one. would you entertain custom orders on the aprons, if you continue to make them? thank you everyone for your kind words. I would certainly make custom aprons and will be listing more in the next few weeks. Looks great--your Mother will love it! You are so very welcome Michele:-) I love this apron and the "imperfect" fabric...that's precisely what makes it Perfect!!! I love the beauty and perfection of the imperfection! It's great! Imperfections of color and all. Love that watering can too. Thank you so much for linking this up! I truly appreciate your participation in "Cowgirl Up!" and I hope you'll join us again next week. 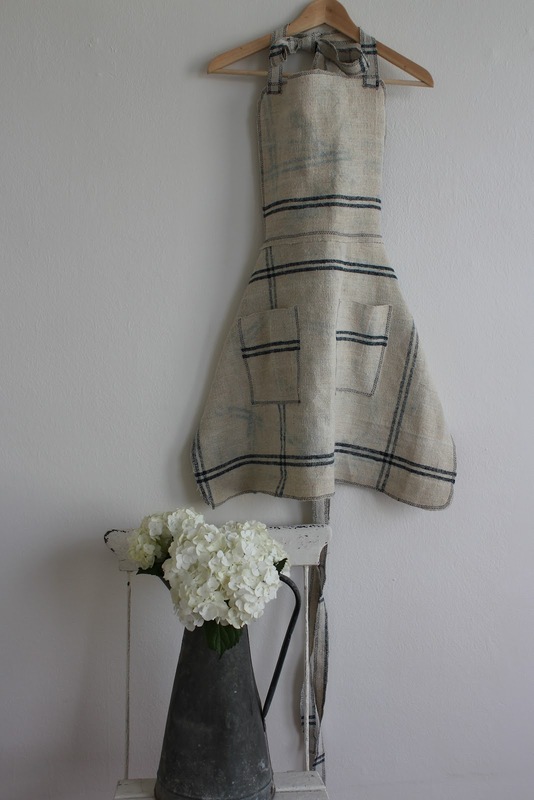 What a darling apron...I love everything you sew!